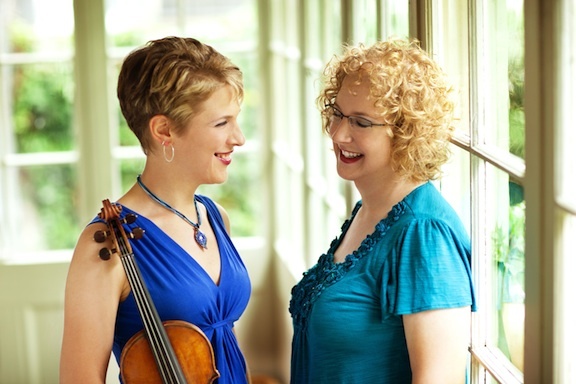 The riveting performances of the Caswell Sisters, vocalist Rachel and violinist Sara, are the culmination of years of working together. Their seamless sound combined with their unique interpretation of repertoire ranging from the “Great American Songbook” to contemporary jazz, including their own compositions, is propelled by arresting improvisation. Rachel and Sara co-lead the Caswell Sisters Quintet and have made such notable appearances as a weeklong After-Hours engagement at Dizzy’s Club Coca-Cola at Jazz at Lincoln Center in New York City and an enthusiastically-received set on the opening night concert of the inaugural Jazz Education Network (JEN) Conference. Their debut Caswell Sisters album Alive in the Singing Air (Turtle Ridge Records) featuring jazz pianist Fred Hersch was released in 2013 to rave reviews and was selected by jazz critic Thomas Cunniffe as one of the year’s “Best Vocal CDs” on Jazz History Online. In addition to the musical partnership Rachel and Sara have shared since childhood, their development and experience as individual artists play an equally important role in their musical careers. Rachel, a master of vocal improvisation and lyric interpretation, regularly performs with guitarist Dave Stryker and bassist Jeremy Allen, culminating in the release of her highly-praised 2015 CD For All I Know (Turtle Ridge Records), an album of duets with these two outstanding musicians. She has performed at clubs and festivals around the country and with big bands such as the Glenn Miller Orchestra and musicians the likes of John Blake, Jr., Ingrid Jensen, the Billy Taylor Trio, and Curtis Fuller. Her performances also include appearances at the IAJE and JEN annual conferences, most recently with her quartet at the 2016 JEN Conference in Louisville, KY. Rachel has given numerous jazz vocal masterclasses/clinics at colleges and universities throughout the US and is currently on faculty for the Music in General Studies Dept. at the Indiana University Jacobs School of Music, teaching jazz-related courses. In addition to her more recent work, she also received rave reviews for her debut jazz CD Some Other Time (2003). Sara, a 2018 Grammy nominee and “Rising Star” in the DownBeat Magazine Critics and Readers Polls every year since 2013, regularly performs with several ensembles, including clarinetist David Krakauer’s The Big Picture and mandolinist Joseph Brent’s 9 Horses. She has toured extensively with bassist/vocalist Esperanza Spalding, vocalist Roseanna Vitro, and violinist Mark O’Connor, and has performed and/or recorded with artists such as Brad Mehldau, Fabian Almazan, Linda Oh, Regina Carter, Laila Biali, Gene Bertoncini, Alan Ferber, Skitch Henderson, Kishi Bashi, and Bruce Springsteen. She is a member of the New York Pops with whom she has been a featured soloist several times in Carnegie Hall, and was part of the house band for NBC’s weekly variety show “Maya & Marty” starring Maya Rudolph and Martin Short. Currently on faculty at both the Berklee College of Music and Manhattan School of Music, Sara has won over 100 awards and first-place prizes in the jazz and classical competition worlds, and has released two highly-acclaimed jazz CDs: First Song (Double-Time Records) and the award-winning But Beautiful (Arbors Records). These talented siblings share much in common: both studied jazz from an early age with Indiana University Jacobs School of Music Distinguished Professor David Baker, both attended IU on full scholarship as Wells Scholars and graduated with High Distinction in classical Performance and Jazz Studies, both went on to earn masters Degrees in Jazz Performance (Rachel at New England Conservatory in Boston and Sara at Manhattan School of Music in New York), and both were invited to participate in the Thelonious Monk Institute’s Summer Residency program in Aspen/Snowmass, CO, where they worked with major jazz artists. This shared background enhances the Caswell Sisters’ unique combination of sound and artistry.